West Fraser opens $30M lignin recovery plant in Hinton, Alta. The West Fraser Timber Co.’s pulp mill in central Alberta has begun making more than just wood pulp for paper. 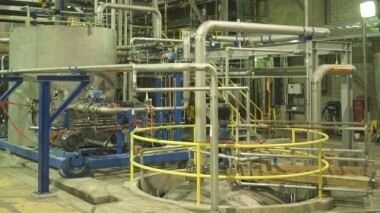 The forest products company has completed work on Canada’s first commercial-scale lignin recovery plant, which is designed to extract a natural wood byproduct called lignin and repurpose it for use in a range of new value-added products. Along with a $3 million contribution from AI Bio, the $30 million plant received funding from the federal government through Natural Resources Canada and Sustainable Development Technology Canada, as well as from West Fraser itself. The facility is one of many examples of a Canadian company leveraging a sustainable material to create products that reduce the overall economy’s reliance on coal, crude oil and natural gas. Having begun lignin production at the new facility in March, West Fraser plans to use the byproduct as a renewable substitute for a number of synthetic resin components currently derived from fossil fuels. Other potential applications include green chemicals, thermoplastic composites and packaging. As West Fraser ramps up lignin production in Hinton, the company’s president and CEO, Ted Seraphim, said all of Canada’s pulp mills could potential use the technology to produce new products.